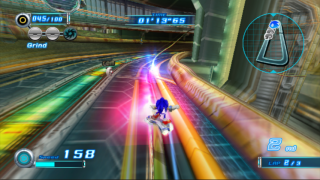 Megalo Station is the first level in Heroes story of Sonic Riders: Zero Gravity. The race takes place in and around the towering, 300-storey sky-train terminal in the futuristic city of Monopole. There are a lot of traincars zooming to and fro, which can be a problem or an opportunity. The track contains various shortcuts, some of which prove quite well hidden. Beserk robots from MeteorTech attempt to stop Sonic and his companions! Use the power of the meteorite to evade their pursuit! Heading to Megalo Station in Tails' hovercar, Team Sonic hear a radio broadcast about the G.U.N. investigation into the troubles which have recently befallen the city's MeteorTech robots. Sonic's attention, however, is more focused on the strange meteorite (an Ark of the Cosmos) which Tails found last night. Driving through the metallic bowels of the vast train terminus, these two pieces of news intersect unpleasantly for the heroes. The station's electronic surveillance (presumably under the control of Eggman's co-opted mother computer) detects the Ark in the Team's possession, and summons swarms of MeteorTech 'bots to attack them. The team manages to escape in a vehicle elevator, but Tails' somewhat dangerous underage driving leads to an explosive conclusion; with Sonic being hurled from the 300th floor of the station. Suddenly, the meteorite flashes and stops Sonic dead in the air. The hedgehog lands safely, but robots continue to chase him - leading to the level's race. There is a significant shortcut available on this level, but the player needs to get a special item from a capsule - which is random, so the chance to get there is small. It is situated in the long, straight segment of the level with the red traincars, where Gravity Drive often gets employed. Up on the higher stage, the route is marked with green stripes. If you can get up there, a character uses a vehicle and drive through some part of the track much faster.